Xylem is ranked 7th on Fortune's 2018 Change the World list. Xylem Inc has been named to Fortune magazine’s 2018 Change the World list, a ranking of 50 companies that have made a significant social impact through their core business strategy. Ranked number 7 in the listing, Xylem has been recognised for creating tangible social value through its innovative solutions that are helping to solve water challenges across the world. 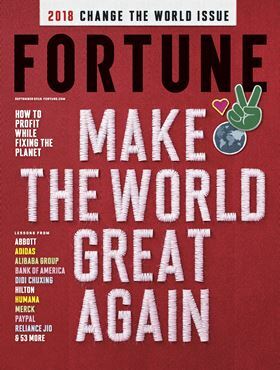 Now in its fourth year, Fortune’s Change the World list recognises companies that have had a positive social impact through activities that are part of their core business strategy. The Change the World list ranks companies using factors including measurable social impact, business results, degree of innovation and corporate integration. Fortune recognised Xylem’s ongoing work to help strengthen cities’ resilience so they are better equipped to cope with the impact of climate change and natural disasters, and Xylem’s actions to advance smart water solutions. The company’s role in supporting the recent Thai cave rescue was also noted. A team of Xylem engineers worked with the Thai authorities to reconfigure the dewatering pumps in place at the cave, increasing pumping capacity by 40%. Xylem to become the Manchester City Football Club’s Official Water Technology Partner. The Opportunity of a Lifetime puts a spotlight on Xylem's progress over the past year to advance its sustainability goals.